Whilst you might feel like you have been constantly changing, schools have not changed as much as many other organisations. Are we learning as fast as our world is changing? If not, why not? Now more than ever school leaders need to move beyond conversations about change and start making changes. Many school leaders are operating as “accidental designers”, occasionally stumbling across innovative ideas or solutions. 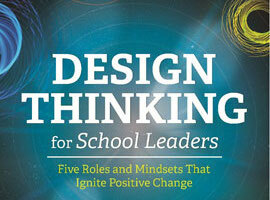 The authors of Design Thinking For School Leaders, Alyssa Gallagher and Kami Thordarson, advocate that school leaders need to deliberately adopt the following five designer roles and mindsets, if we are to reimagine schools to meet the needs of 21st century learners. Producer – action orientated and getting things done quickly, creating rapid learning cycles and taking responsibility for producing a “final” product. Storyteller – uses story to capture the hearts and minds of the community. The designer approach to leadership is aligned with the move to inquiry, project-based learning, collaboration and problem solving approaches to learning. Design Thinking is a process for problem solving and a method for creative action whose origins date back to the 1960s, as a way to solve “wicked” problems. Wicked problems are those that are difficult or impossible to solve because of incomplete, contradictory and changing requirements that are challenging to recognise. Wonder and Question – How might my perceptions or assumptions influence my thinking? Empathise – Who is my user? What is important to them? Define – Create a point of view that is based on user needs and insights – What are their needs? Ideate – Ask crazy questions – How would I solve this problem if I had $1 million? Prototype – Build a representation of one or more of your ideas to show others. What does a rough draft of this idea look like? Test – What worked? What didn’t? What can be improved? Reflection – What evidence do we have that we are self-aware and self-correcting as we move through the process? I particularly like the author’s observations about change and how this can cause us to default to maintain the status quo. It is for these reasons that schools have not evolved as rapidly as many other organisations. Shifting beliefs is always harder than shifting actions. Top-down change takes away all the voice and choice of our adult learners. Culture is an essential component to the change process. Transparency and collaboration are critical. Life is lived in perpetual beta. Fun is a crucial component of the change process. Change fatigue results from incremental change. We would achieve far more if we were brave, ambitious and took great leaps rather than being excessively cautious, pessimistic and taking baby steps. Doing what we have always done won’t get us what we want….the world is changing. The only way we can be learning as fast as our world is changing is by being brave, ambitious and taking great leaps.